11:30-12:45 | Website session: Rod Torreson with students, Thru the 3rd Eye; David Cope on professional websites and use of online sources. Exploration of Thru the 3rd Eye, Rod Torreson’s laureate project with students and former students: the website as a way of making connections, developing interviewing and review skills, selection of poems for publication by poets ranging from the well-known to the youthful beginner. If there is time, David Cope will also demonstrate the uses of the poet’s personal/professional website, “scene” sites and websites connecting one to the larger world of poetry publishing. 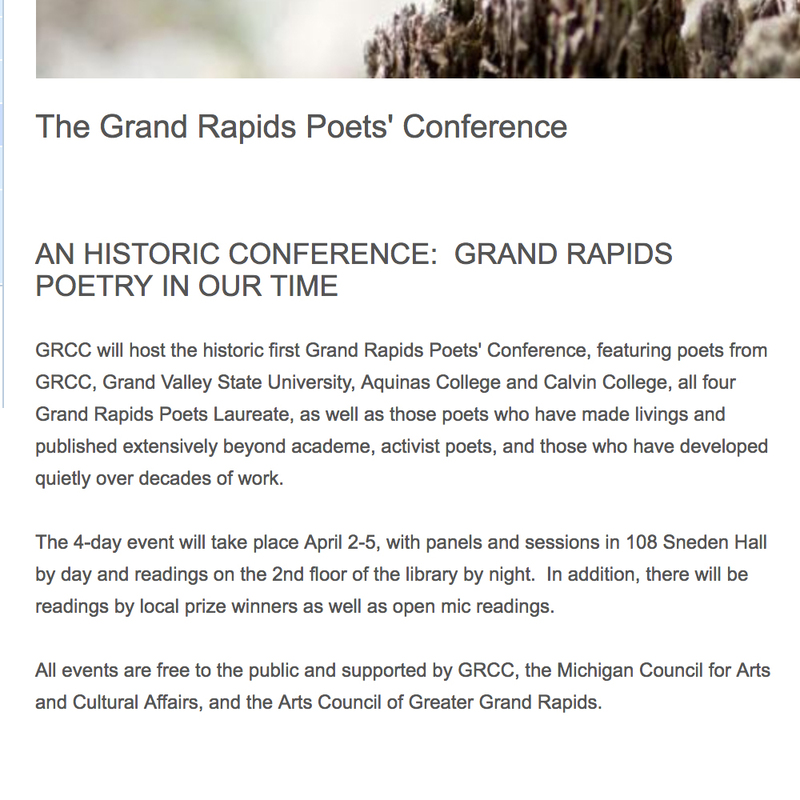 GVSU, Aquinas, Smokin’ Spoken Word, Literary Life Bookstore & More, WYCE Electric Poetry. The reading series is both an important means by which to bring local communities of writers together as fellow writers on a journey to awareness and a way to bring local communities into contact with nationally and internationally prominent poets whose work instills an awareness beyond the confines of the provincial limits of an otherwise disconnected local scene. This panel explores that nexus as seen through two major college series, two local reading series, and our local radio series. Panelists will also reflect on the importance of the audience, questions about the art of the reading, and promotion of the series. 7:00-8:30 | READING: Patricia Clark, Rod Torreson, Azizi Jasper, David Cope. 11:15-12:45 | Open mic reading. Poetry is most importantly made visible through publication, first in journals, magazines, online zines, broadsheets and even self-published books. Young poets and writers entering the arena of publishing for the first time often do not understand the craft of publication, which involves the nature of submitting one’s work, working with editors, understanding of copyright and contracts, and the process of publication. This panel includes some of the most heavily published Grand Rapids poets, who will reflect on these questions and the journeys that they have made in the world of publication. Originally Published by The Grand Rapids Poet Conference, click here to view page archive. Originally Published by PoetLaureateDebut, click here to view.